As in any country, over time a few cities or municipalities will inevitably rise to the top and shine amongst their peers. A variety of factors may contribute to this trait amongst so many societies- perhaps it is the result of good governance? What about natural resources? Access to markets and a solid infrastructure surely don’t hurt when looking at places to relocate as well. Sometimes these magnetic hubs are plagued by blighted neighbors. In a society this basic, it’s quite easy to witness a culture of “have and have-nots” as basically any material good you see in the villages is a result of humanitarian assistance. Unfortunately, while this aid might have been sent with the best of intentions, it can easily and all too often be utilized to further empower a corrupt official. Jaji could very well be described as one of the shining stars of Afghan districts. 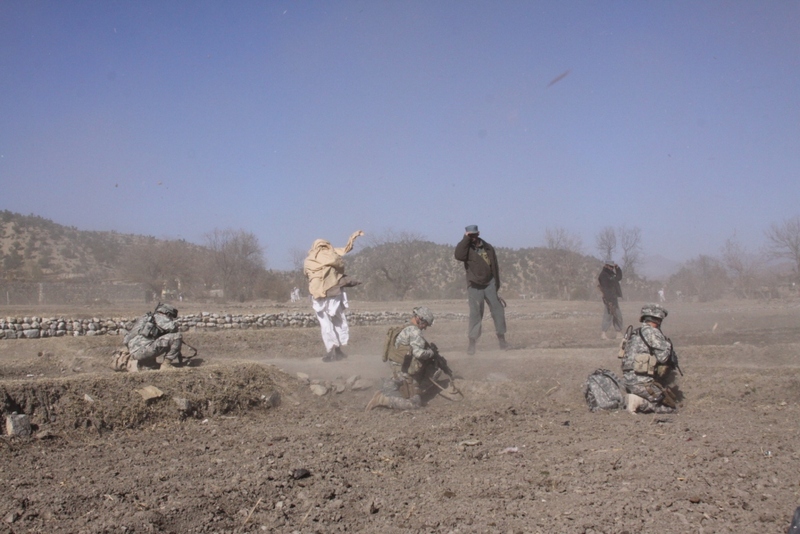 Most recently, Jaji was coined with the coveted “District of Peace” label, distinguishing the district from the other twelve districts in the Khost Province. 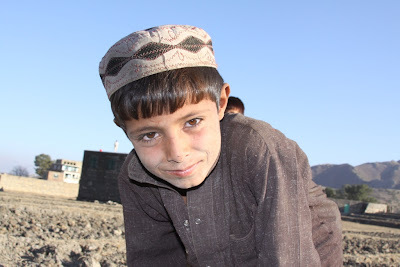 (Afghanistan has 34 Provinces total, each province is further broken down into districts, then villages, and finally even into tribes in some cases.) 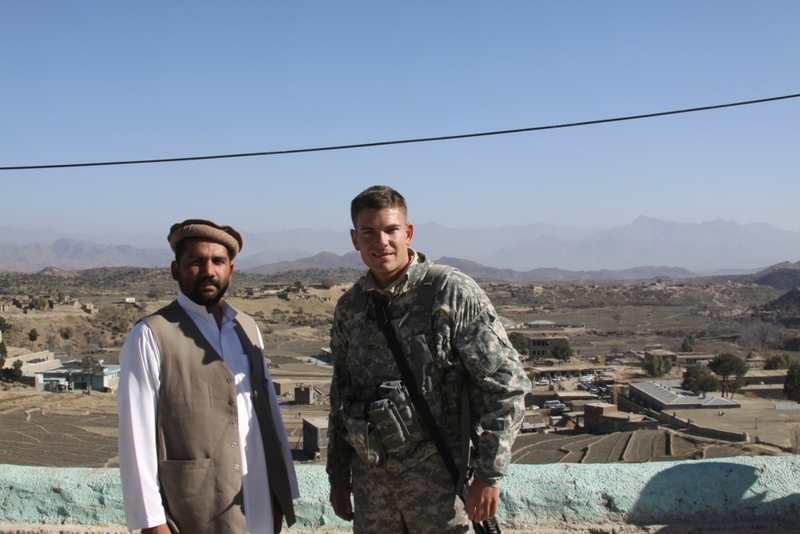 Jaji Meidan is neighbored by two of the most dangerous or in military terms (kinetic) districts in the entire Khost Province. Because of this security threat, a ground convoy to Jaji is rarely an option as you would surely encounter numerous homemade explosives along the way. The primary mode of transportation to most districts in the northern region of the Khost Province is by Blackhawk helicopter. 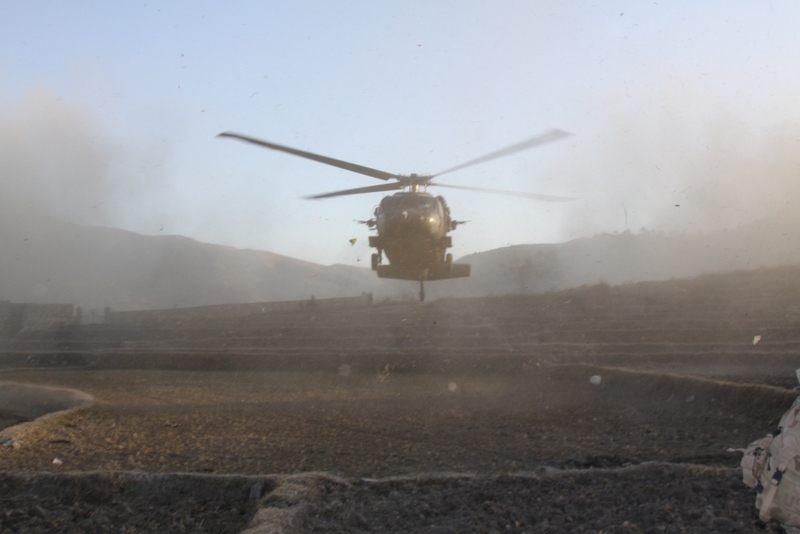 These helicopters are the logistical lifeline of countless smaller “combat out-posts” or “fire bases” scattered throughout the mountainous eastern border region of Afghanistan. The commanders of these combat out-posts are what we call the “battle-space owners” of an area. Meidan District Governor and Police Chief are also present. 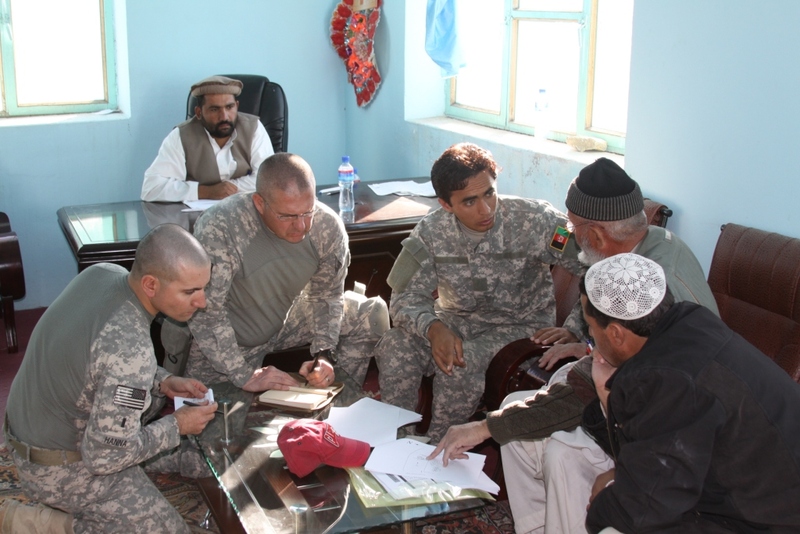 In keeping with the joint operations and “all-hands on deck” theme, the battle-space owner of the Jaji Meidan District decided he would like to conduct a meeting with the District Governor. This would require the combat operations folks, the Human Terrain Team (cultural experts), the Provincial Reconstruction Team, and the Agribusiness Development Teams all to send representation. Any loyal reader of this blog can probably already guess where this is going, but I’m actually happy to report that after a delay of only three hours, I was on-board a Blackhawk and headed for Jaji Meidan (I’ll take three hours over my last wait of 28 days anyday). I was also accompanied by three other members of our ADT, who would be augmenting security for some of the other meeting participants around the Jaji District Center. After a few strategic pick-ups along the way, we were preparing to touch down in Jaji. Our landing zone was reportedly a rice paddy, but as we arrived it looked more to be a freshly planted wheat field. As the field sat on a hillside and each plot of wheat was articulately terraced for erosion control, our pilot did a phenomenal job of sitting us down just fine. Immediately upon exit I noticed all of my other passengers were now hitting the ground in the prone position to provide cover for the choppers as they exited the area. 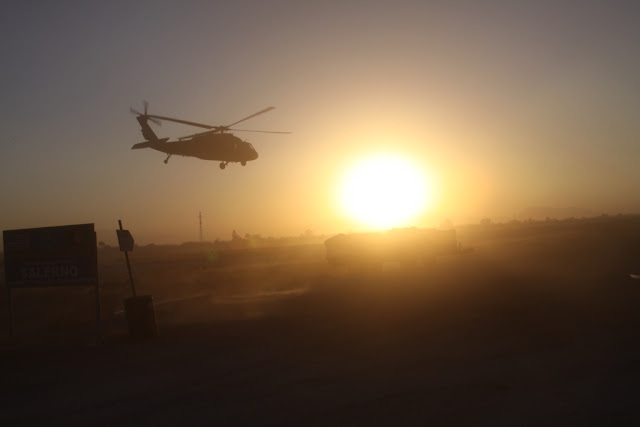 You might imagine what a storm of dust and debris a Blackhawk can make as it takes off from a loosely tilled spot of barren earth. As Governor Eunis welcomed us all into his district center, it was obvious that he was a very intelligent man and capable leader. The primary goal of our meeting was to discuss the arbicai project in the district, similar to a county sherriff’s reserve or auxiliary program. 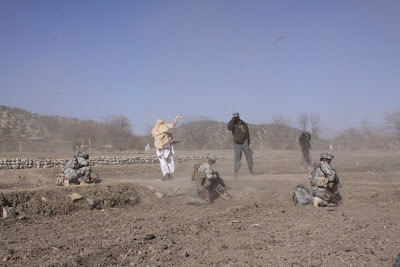 Jaji Meidan first found itself in the national spotlight as the district residents successfully defended themselves from the Taliban earlier this decade. The will of these townspeople has been strong enough to thwart any attempts at infiltration by numerous insurgent groups over the years. After the combat ops and also the PRT folks had discussed a few projects, I discussed a few agricultural issues with Governor Eunis. Unfortunately, the district’s agricultural extension agent was traveling to the capital during my visit, so we couldn’t get too in-depth in our discussions. Following our meetings, it was time to head back to our terraced landing zone. As we were awaiting our transport to arrive, the village children began to notice us lingering around the field. Slowly but surely, they one by one started moving cautiously towards our group. I’ve mentioned earlier the dangers of giving hand-outs, especially while in a giant vehicle that could potentially run over the children. The beautiful part of today’s mission was that I was traveling by air. If they were foolish enough to be around during a Blackhawk landing, they deserved whatever trinkets they could solicit! district engineers as Governor Eunis watches over. Before heading out, I stocked my lower pocket with little giveaways in hope that I might have a chance to interact with some of the youth of the village. While I lay in the prone position with my rifle ready to defend against anyone who might try to alter our anticipated ride out of there, a small boy around the age of eight started towards me. I placed a deck of cards, a keychain, and a pen out about three feet in front of me as a sort of bait for him. You can imagine the courage it took for this little guy to slowly inch closer towards a line of armed men, but never underestimate the curiosity of a young boy. Whatever the cost, you can bet that he was going to get whatever I had laid out there in front of me. As we played a bit of peek-a-boo behind the terraced walls of the field, he eventually made his way up to our position and was delighted to find the goodies I had positioned for him. In the meantime, another group of children was beginning to gather around one of our interpreters. One of the other troops had given these young children an instructional book to learn English, so the interpreter started reading to the children. What then took place will forever remain one of the great images of my time here, nearly 15 young boys started an English class right there in the middle of the field. Of course after about three minutes of repeating word for word, the novelty of a new language wore off and the boys were ready to move on to something new. By this time I was out of trinkets in what had previously been my fully stocked pocket. The only thing I had left was my iPhone…let the swarm begin. I first began showing them pictures of my family and other images that were saved on the memory. Next we moved to iPhone video recording, and as you might imagine they really enjoyed that as well. As they all fought to “touch” this seemingly magical device, I was careful to always keep one of my hands on it as well. While I consider myself a decent runner, I wasn’t about to challenge one of these kids half my age to a footrace over a terraced wheat field, especially in 60 lbs of body armor! After recording a few videos for the kids, I decided to play them a few songs to gauge their taste in music. From Johnny Cash’s “Folsom Prison” to “Beat it” by Michael Jackson, the boys were soon laughing hysterically as I did my best impersonation of each. All good things must come to an end, and so must my karaoke days in the hills of the Jaji Meidan district. Shortly into “Barbara Ann” by the Beach Boys, the communications sergeant yelled that the birds were three minutes out. As quick as the interpreters shouted for the children to clear the area, they were gone in a flash. 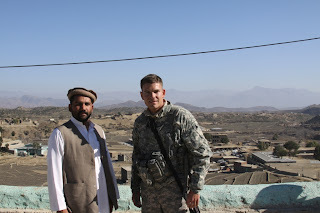 Within seconds a few attack helicopters started circling overhead to provide cover and before you knew it the familiar sound of a Blackhawk’s rotor blades beating into the wind came from around the hillside. Looking back on our time in Jaji, I can’t help but think of the popular adage “the lord helps those who help themselves”. In a society that was beaten down into total governmental dependence by communism only 30 years ago, it’s definitely a welcomed sight to see people actually taking pride in their village and exerting some initiative. For the first time in my two months here, I saw a group of people who were willing to do whatever it takes to defend themselves. Because of this optimism amongst the people and their ability to defend themselves, governmental programs and dollars will continue to flow towards the people of Jaji Meidan. Our ride home...we weren't in a big rush, but it's always a welcomed sound. Dan, thanks for the kind words. It's great to see that so many folks are interested in our mission over here. Merry Christmas to the Morken's and please continue to provide feedback. It's great to know what people are interested in!